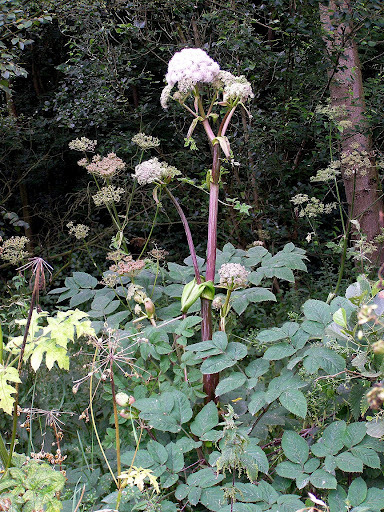 Wild Angelica fills a great niche in the Forest Garden. 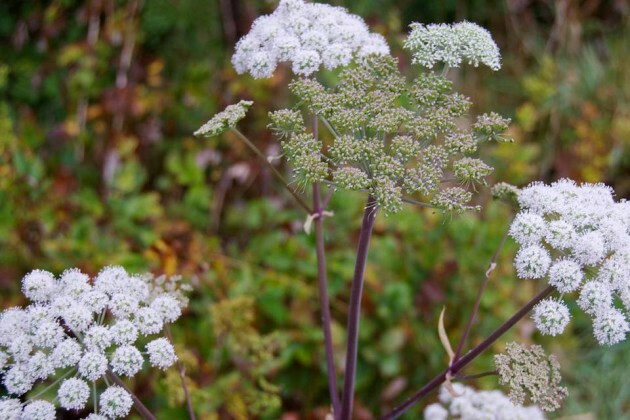 Wild Angelica is just a really pretty plant! Native to Europe (including Britain) and Western Asia. No improvement has been conducted on this plant. It is now commonly viewed as either a wildflower or a weed in its native range. The flower stalk can shoot up 2-3 times the height of the plant. 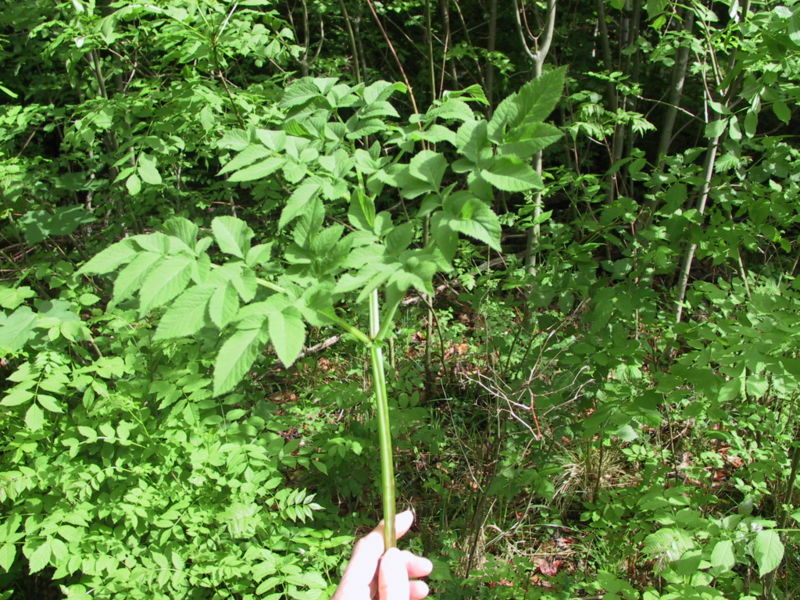 The leaf structure of Wild Angelica… yeah, it’s the entire thing. 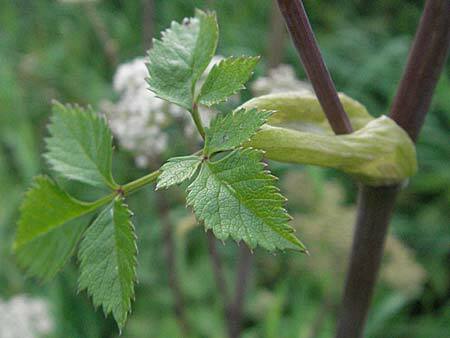 There are many leaflets per true leaf, and the leaf stem resembles a stalk of celery. Flowering: July – September. Remember this is a biennial plant; flowering only occurs on 2-year old plants. 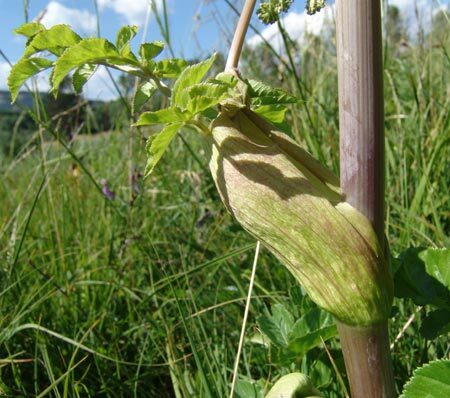 Life Span: If not dead-headed, Wild Angelica will live 2 years as it is a biennial, but this plant self-seeds rather easily so this issue is rather moot. 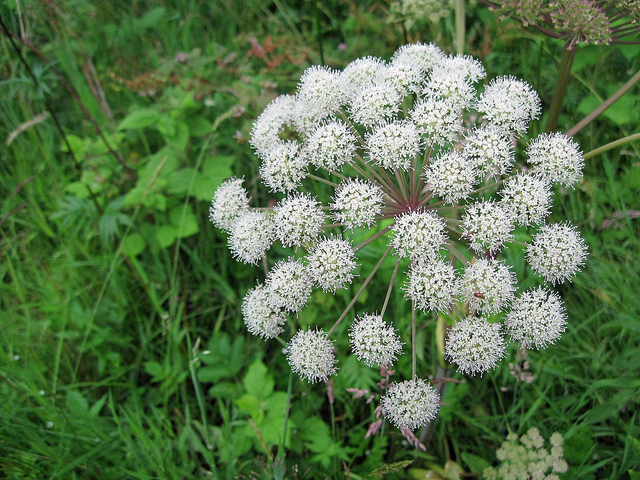 Wild Angelica’s flowers are magnets for beneficial insects. Note the characteristic “sheath” at the base of the lower leaves and the purple hue of the stem. 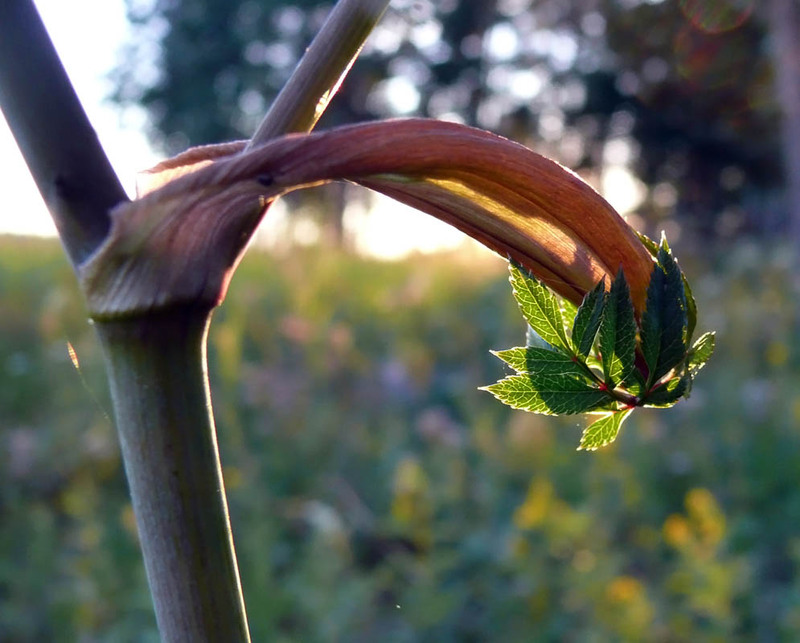 Stems have no hairs and are not ridged (like Cow Parsnip). 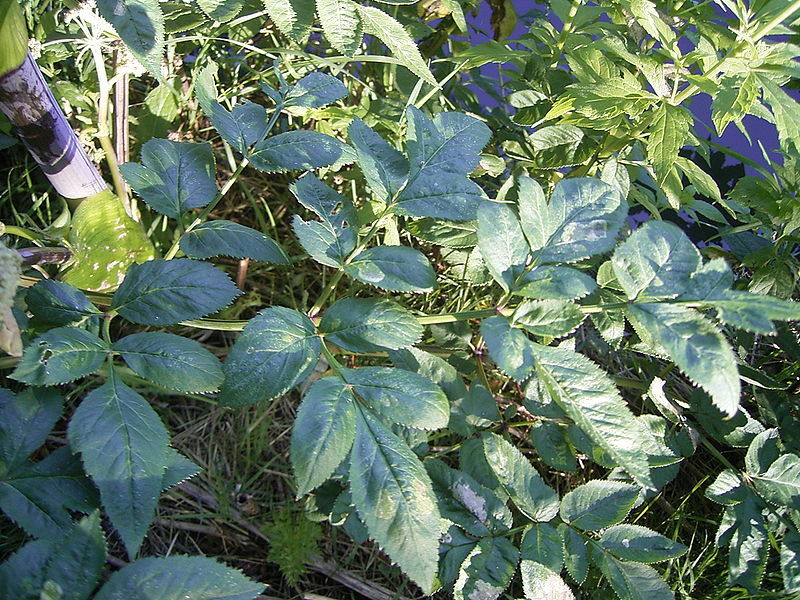 Take advantage of its moisture tolerance and plant in wet areas that other plants cannot grow. Propagation: Usually from seed. 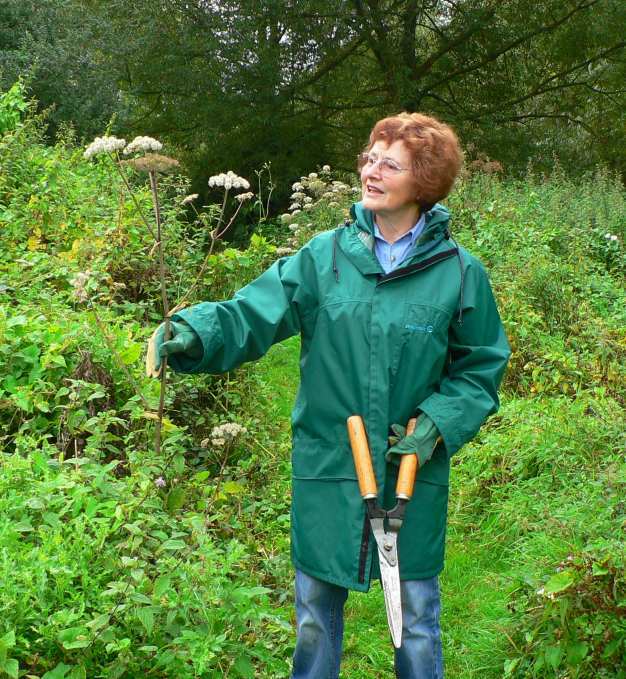 Wild Angelica readily self-seeds in August through October. 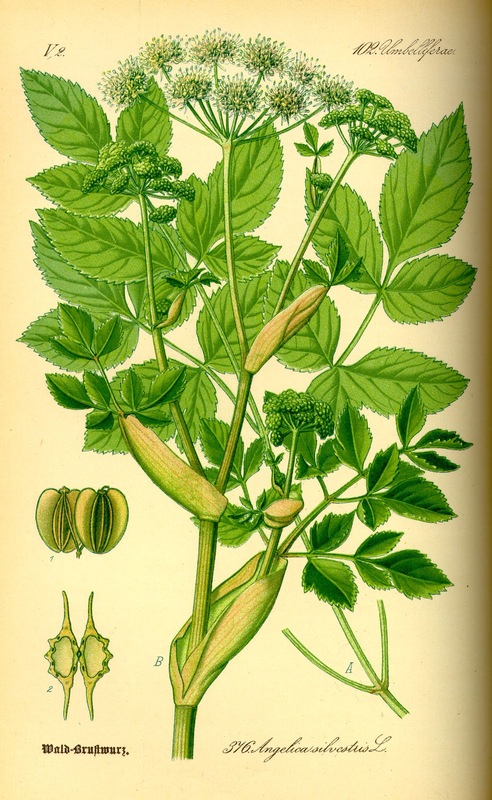 All plants in the genus Angelica contain the chemical furocoumarin which can cause a phytophotodermatitis (phyto = plant; photo = light; dermatitis = skin irritation)… there is a potential if the juice from this plant gets on your skin, your skin may become sensitive to light. This compound (if the plant is eaten in large quantities) may alter the metabolism of medications a person may be taking. 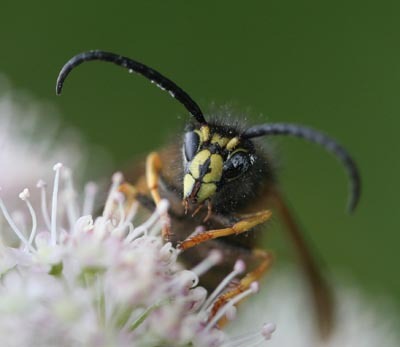 Tiny, beneficial Ichneumon wasps feed on nectar produced in the small flowers of Angelica.